Lhotse is best known for its proximity to Mount Everest and the fact that climbers ascending the standard route on that peak spend some time on its northwest face, see below. In fact Lhotse has one of the smallest topographic prominence values of any official eight-thousander, as it rises only 610 m (2,000 ft) above the South Col. Hence it is often seen as a minor eight-thousander. However, Lhotse is a dramatic peak in its own right, due to its tremendous south face. This rises 3.2 km (1.98 mi) in only 2.25 km (1.4 mi) of horizontal distance, making it the steepest face of this size in the world. The south face has been the scene of many failed attempts, some notable fatalities, and very few ascents (one of them, by Tomo Cesen, unverified). An early attempt on Lhotse was by the 1955 International Himalayan Expedition, headed by Norman Dyhrenfurth. It also included two Austrians (cartographer Erwin Schneider and Ernst Senn) and two Swiss (Bruno Spirig and Arthur Spöhel), and was the first expedition in the Everest area to include Americans (Fred Beckey, George Bell, and Richard McGowan). The Nepalese liaison officer was Gaya Nanda Vaidya. They were accompanied by 200 local porters and several climbing Sherpas. After a brief look at the dangerous southern approaches of Lhotse Shar, they turned their attention, during September and October, to the West Cwm and the northwest face of Lhotse, on which they achieved an altitude of about 8,100 metres (26,600 ft). They were beaten back by unexpectedly strong wind and cold temperatures. Under Schneider's direction they completed the first map of the Everest area (1:50,000 photogrammetric). The expedition also made several short films covering local cultural topics, and made a number of first ascents of smaller peaks in the Khumbu region. The main summit of Lhotse was first climbed on May 18 , 1956 by the Swiss team of Ernst Reiss and Fritz Luchsinger from the Swiss Mount Everest/Lhotse Expedition. On May 12 , 1979 , Zepp Maierl and Rolf Walter of Austria made the first ascent of Lhotse Shar. Lhotse Middle remained, for a long time, the highest unclimbed named point on Earth; on May 23 , 2001 , its first ascent was made by Eugeny Vinogradsky, Sergei Timofeev, Alexei Bolotov and Petr Kuznetsov of a Russian expedition. On 31 December 1988 , Krzysztof Wielicki , a Polish climber, completed the first winter ascent of Lhotse. As of October 2003 , 243 climbers have summitted Lhotse and 11 have died. 1955 Attempt by the International Himalayan Expedition. 1956 First ascent of the main summit. 1965 First attempt on Lhotse Shar by a Japanese expedition - reached 8,100m. 1981 April 30 Second ascent of the main summit by Hristo Prodanov , Bulgaria . 1989 Jerzy Kukuczka perishes while climbing the South Face of Lhotse, when his secondhand rope breaks. 1996 Chantal Mauduit becomes the first woman to reach the summit of Lhotse. 2001 First ascent of Lhotse Middle. Lhotse Middle was first climbed in 2001 by three groups of Russian climbers. At the time it was the last unclimbed named eight thousand metre summit. The 2001 climb was not the first expedition to the peak; the idea of its ascent was originated by Vladimir Bashkirov (who died in an avalanche in a 1997 expedition). 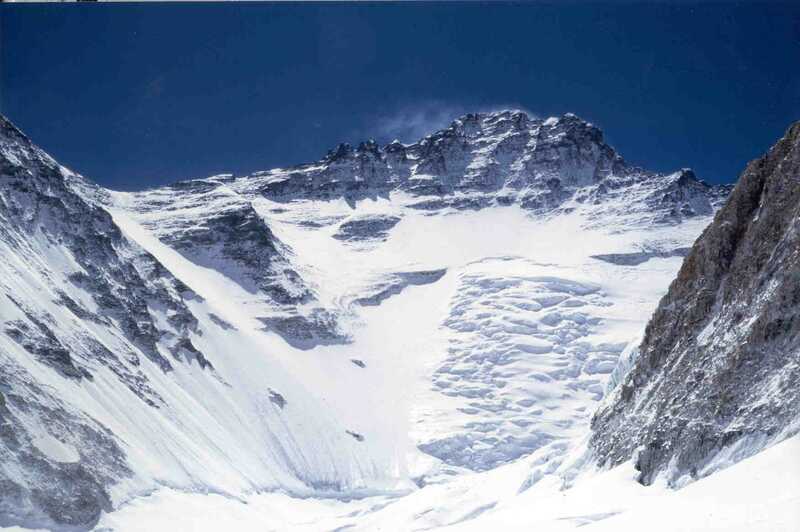 Lhotse is connected to Mount Everest via the South Col. The western flank of Lhotse is known as the Lhotse Face . Any climber bound for the South Col on Everest must climb this 1,125m (3,700ft) wall of glacial blue ice. This face rises at 40 and 50 degree pitches with the occasional 80 degree bulges. High altitude climbing Sherpas and the lead climbers will set fixed ropes up this big wall of ice. Climbers and porters need to establish a good rhythm of front-pointing and pulling themselves up the ropes using their Jumar . Two rocky sections called the Yellow Band and the Geneva Spur interrupt the icy ascent on the upper part of the face. DAY 01 Arrival Kathmandu, transfer to hotel. DAY 03 Kathmandu Expedition Briefing & preparation day. DAY 58 Flight Lukla-Ktm, transfer to hotel. DAY 59 Kathmandu , hotel. Mt. Lhotse climbing permit and all govt.taxes. 6 (six) nights hotel accommodation in Kathmandu on BB basis. Excess baggages and domestic cargo. All airport/hotel transfers by private transport.